Giorgia Vollmeier, Master of Science in Management student at the Faculty of Economics at USI in Lugano, Switzerland. 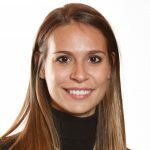 Giorgia is currently writing her master thesis in collaboration with the Institute of Communication Technology at the Faculty of Communication Science. She is investigating needed digital fashion skills and skills gaps within online communication and eCommerce field.